This article is about the 2015 successor of Hewlett-Packard. For the predecessor company, see Hewlett-Packard. For other uses, see HP (disambiguation). It has been suggested that this article be merged into Hewlett-Packard. (Discuss) Proposed since January 2019. HP Inc. (also known as HP and stylized as hp) is an American multinational information technology company headquartered in Palo Alto, California, United States. It develops personal computers (PCs), printers and related supplies, as well as 3D printing solutions. 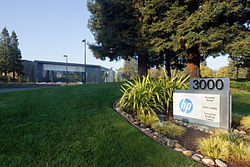 It was formed on November 1, 2015, renamed from the personal computer and printer divisions of the original Hewlett-Packard Company, with its enterprise products and services businesses becoming Hewlett Packard Enterprise. The split was structured so that Hewlett-Packard changed its name to HP Inc. and spun off Hewlett Packard Enterprise as a new publicly traded company. HP Inc. retains Hewlett-Packard's pre-2015 stock price history and its former stock ticker symbol, HPQ, while Hewlett Packard Enterprise trades under its own symbol, HPE. HP is listed on the New York Stock Exchange and is a constituent of the S&P 500 Index. It is the world's largest personal computer vendor by unit sales, having regained its position in 2017 since it was overtaken by Lenovo in 2013. HP ranked No. 58 in the 2018 Fortune 500 list of the largest United States corporations by total revenue. HP Inc. formerly was known as Hewlett-Packard. Hewlett-Packard was founded in 1939 by Bill Hewlett and David Packard, who both graduated with degrees in electrical engineering from Stanford University in 1935. The company started off in the HP Garage in Palo Alto, California. On November 1, 2015, Hewlett-Packard was renamed to HP Inc. and the company enterprise business were spun off and renamed to Hewlett Packard Enterprise. In 2016, HP announced a focus on users who upgrade their computers frequently and spend more money on games and released the game-centric Omen brand of laptops and desktops targeted at mid-range customers. In November 2017, HP acquired Samsung Electronics' printer division for $1.05 billion dollars (USD). HP develops personal computers (PCs), printers and related supplies, as well as 3D Printing solutions. In 2016, total revenue of US$48.238 billion included US$16.982 billion from the sale of notebook computers, US$9.956 billion from the sale of desktop computers, US$11.875 billion from the sale of printer supplies, US$5.131 billion from the sale of commercial printers, and US$1.254 billion from the sale of consumer printers. Approximately 63% of revenue in 2016 came from outside of the United States. Laptops & 2-in-1s: All of HPs laptops and 2-in-1 PCs. HP JetAdvantage solutions manages businesses fleets of printers, scanners and MFPs. HP JetAdvantage also has the HP Universal Print Driver, which is a single driver that works with a large variety of HPs drivers. HP Services is the brand used to HPs business services. ^ a b c Darrow, Barb (October 30, 2015). "Bye-bye HP, it's the end of an era". Fortune Magazine. ^ Howley, Daniel (May 26, 2016). "HP debuts gaming PCs, hopes to turn fortunes around". Yahoo Tech. Retrieved May 30, 2016. ^ Choudhury, Saheli Roy (November 1, 2017). "HP completes purchase of Samsung printer business". www.cnbc.com. Retrieved December 22, 2018. ^ "HP Inc. Reports Fiscal Year 2016 Results" (PDF). HP. Retrieved October 18, 2018. ^ "Computer Tower Desktops". Retrieved December 22, 2018. ^ "Laptop & Notebook Computers". Retrieved December 22, 2018. ^ "Z by HP | HP® Official Site". www8.hp.com. Retrieved December 22, 2018. ^ "View All Desktops". Retrieved December 22, 2018. ^ "HP JetAdvantage solutions" (PDF). hp.com. Retrieved December 22, 2018. ^ "HP SERVICES". hp.com. Retrieved December 22, 2018. ^ "MPS Solutions: Managed Print & Document Manage | HP® Official Site". www8.hp.com. Retrieved December 22, 2018.